This seam is to be found on block 68 of the I dropped the button box Quilt. I first covered the seam in some lace. 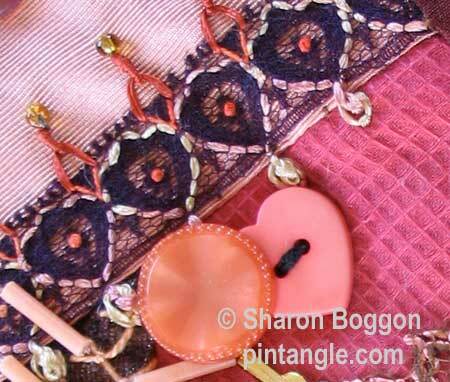 It is is a modern nylon lace and I felt the colour went with the block. I threaded a rayon ribbon floss outlining parts of pattern. I then added oyster stitches along the bottom. The orange fly stitches secured with a bullion are also rayon ribbon floss.